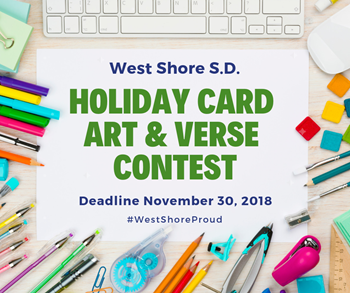 The West Shore School District is seeking the help of our talented students to design artwork and write a verse for the District's official 2018 holiday card. The selected student work will be electronically reproduced and posted on our website and social media pages. The holiday card will also be sent to staff members, local businesses, school board members, and other organizations throughout the area. This year, in addition to recognition at the December School Board Meeting, the selected students will each receive a $50 gift card. Please Note: Students may choose to submit art, submit a verse, or submit both; however, they do not have to do both. We will select a winner for each category. Students who do choose to do art and a verse should submit each entry separately. The verse must not appear on the art. The contest is open to all current West Shore School District students in grades K-12. Only one original artwork creation and/or verse may be entered per student. Art and verse should be appropriate to share with our diverse community, a community which celebrates a variety of holidays. Submissions must be properly labeled with the name of the student, the student’s grade, and school. This can be done on the back of the artwork. Entry constitutes permission to have the student’s work reproduced. Art must be original and not include copyrighted images. Art should be no larger than 8.5 x 11 inches (standard letter size). Students may use watercolors, colored paper, magic markers, crayons, computer graphics, photography, or any combination. Art should not include text as part of the design as it, and the District logo, will be added to the final card design at a later time. Proofread your verse. Submissions will be judged on originality, grammar, spelling, and punctuation. The verse should be no more than 150 words in length. Submissions that do not meet this requirement, or that exceed it, will be disqualified. Submissions should be typed or neatly handwritten. All submissions must be received by Friday, November 30, 2018, at 5 p.m. For your convenience, they may be turned in to any school office or the Administration Center. Please feel free to contact Mrs. Rhonda Fourhman, Coordinator of Community Relations, at rfourhman@wssd.k12.pa.us or 717-938-9577, with any questions. Good luck!